A 27-year-old former Marine appeared in a Houston court Monday for the first time after his arrest on suspicion of murdering 11-year-old Josué Flores. Prosecutors requested a life sentence for Andre Timothy Jackson Jr., accused of stabbing the boy 20 times. They told the judge that Jackson admitted he was the person seen running on security footage near the crime scene. He also confessed he'd been at the crime scene. The homeless veteran was arrested and charged Friday, accused of stabbing and killing the sixth grader as he walked home from school last month. Authorities circulated security footage from local homes and businesses, which they used to identify the suspect. Previously, police had charged a man with a long rap sheet, but started a new search after he was able to prove his alibi. Witnesses told authorities they heard screaming and saw Josué struggling with a man. The boy collapsed on the grass near the sidewalk and the man ran off. 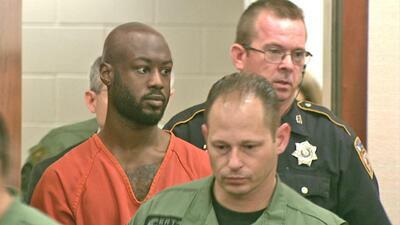 Jackson is being held in the Harris County Jail on a $100,000 bond and faces up to 99 years in prison. The suspect could face the death penalty if authorities upgrade the charge to capital murder. Harris County District Attorney Devon Anderson said Saturday the charge could change "if there becomes some evidence that capital murder is a more appropriate charge." A group of protesters from Houston's Northside neighborhood demonstrated outside the court during the appearance, which lasted less than five minutes. Guadalupe Flores, Josué's older sister, also appeared in court. She said authorities still haven't explained a motive. "[This person] ... took my brother away from me, that's all I could feel," Guadalupe told Univision News. "I could imagine him... stabbing my little brother and... when I spoke to the prosecutors I confirmed that there were 20 stab wounds and one entered his heart." Flores' murder inspired a citizen movement in Houston as the community protests insecurity for families in the area. Monday's march "helped me give my little brother a voice, because he has no voice," said Guadalupe.